Eleven beading superstars, 20 gorgeous all-new projects (not reprints from other books! 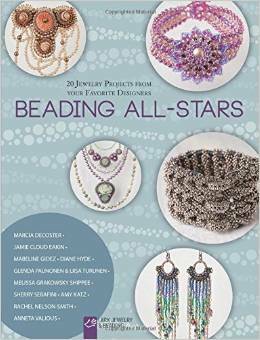 ), how could you not want this book, Beading All-Stars? This is a Lark Book, so you know the photography is beautiful and the attention to detail is superb. Do what exactly are the details? Each designer has a brief bio, and then right into her projects. Rinse and repeat. At the back of the book is a brief glossary and several pages of basic techniques that are used by the various designers. This allows them to get right to the point in their own instructions, but if you are a beginner, you will need to read through the appropriate parts of this section first before attempting the projects. In my opinion, it's a good way to do it, because intermediates and advanced beaders don't want to get bogged down, but beginners need this information! Can't wait to see this book! Great idea. Thank you, but far from!